Its really been a while since we had some good burgers. Sure there are places to visit for them, but we have been to them all. 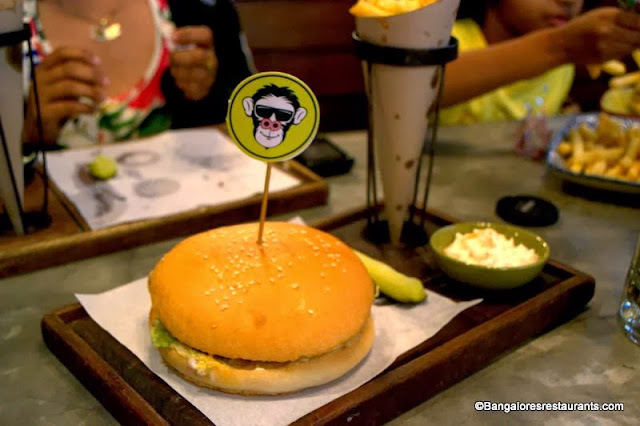 So that's why when the invitation to try out the Monkey Bar Burger Festival came our way, we sat up straight - Its never straightforward with the folks at Monkey Bar - and so it is with this festival - eight gourmet burgers are up for grabs (trust me, grab em' is what you will want to do!). We had three of them ourselves. Here's a look at what's in store for you. 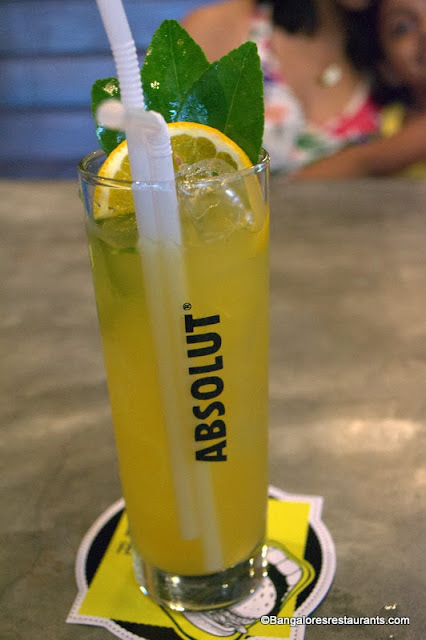 It was a working afternoon and so a Virgin Mojito with Kaffir Lime as the key character found its way to the table - don't let the Absolut glass fool you, it was an alcohol-free afternoon. 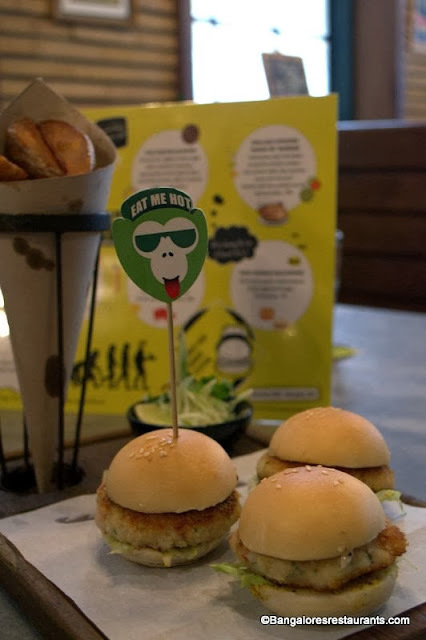 We began with the Seafood Sliders (Rs 395) - crisp brown patties of prawn, crab meat and fish inside freshly made buns. The grain mustard dressing on the patties gives it that nice punch. Do not miss the cucumber slaw on the side for that tangy-spicy kick. The potato wedges and pickled gherkin seal the deal. But what really worked for me is what you see below. It is a rare occasion indeed when Anoushka asks for something - and these "mini burgers" as she called them caught her fancy. What's more - she ate an entire one!! Hallelujah! 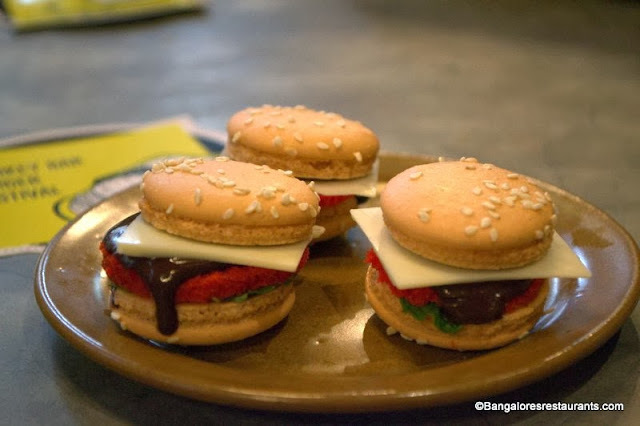 Sudhakar had the Gastro Burger (Rs 595) - this beef burger comes topped with a mushroom ketchup and aged gruyere blue cheese mayo. Every mouthful is a melange of flavors, with the meat being the absolute hero. The great thing about burgers is how each one has the potential to bring so many flavors into one bite and this one lives up to its full potential. 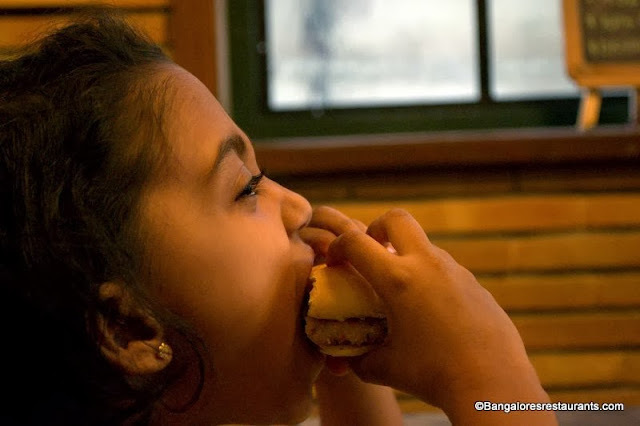 I love me my piggy and so opted for the Sausage Burger (Rs 350) - Pork sausage patty, bacon, honey mustard mayo - The first thing that struck about this burger is how light it was - a very pleasant surprise when you are eating such a fatty meat. But its the lightness that brings the "porkiness" to the fore! A loud Oink of appreciation! There is no drawing a line at this festival and so we had yet another burger - as dessert - Say hello to the Mini Mobar Macaron (Picture Macaron size BTW when looking at this) - Let's see now, with two (Rs 95) to a plate - the construction had a mint leaf on the base for lettuce, red velvet cake for patty, dark chocolate for topping, a square of white chocolate for cheese and a nice sesame seed macaron bun to hold it all. 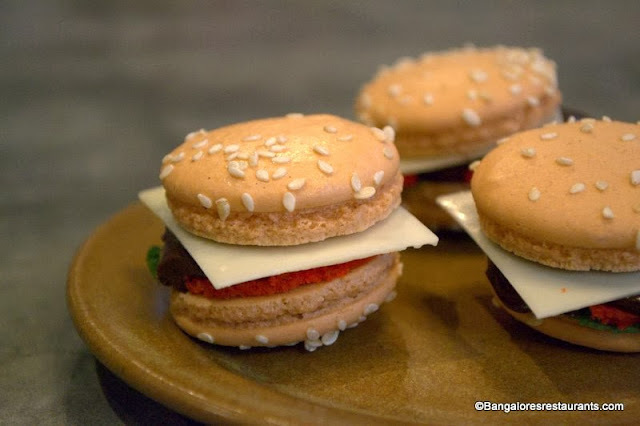 A better look at the Mini Mobar Macaron! One consistent feeling throughout was how the freshness stood out. Freshly made buns totally trump the factory made ones we are often subjected to. 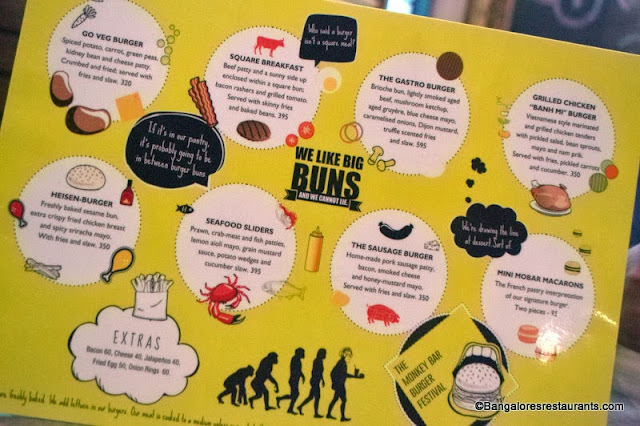 The toppings on the burgers are just enough to enhance taste and not overwhelm the meat. The fries, coleslaw and pickled gherkin complete your experience. 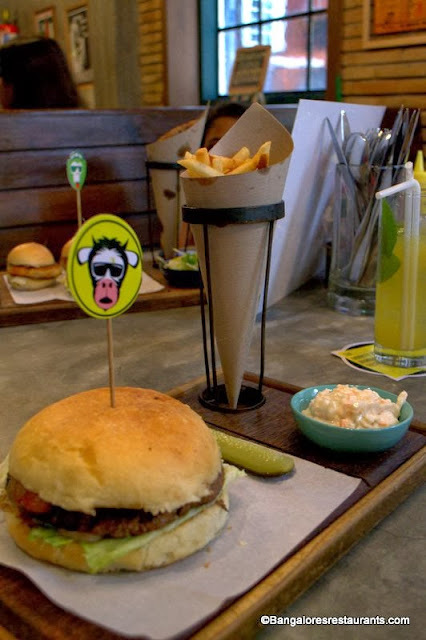 The Monkey Bar Burger Festival runs from Friday, the 29th of November to Saturday to the 14th of December.